Our yard is like walking through the episode of the movie Jumanji when the giant vines start growing through the house. 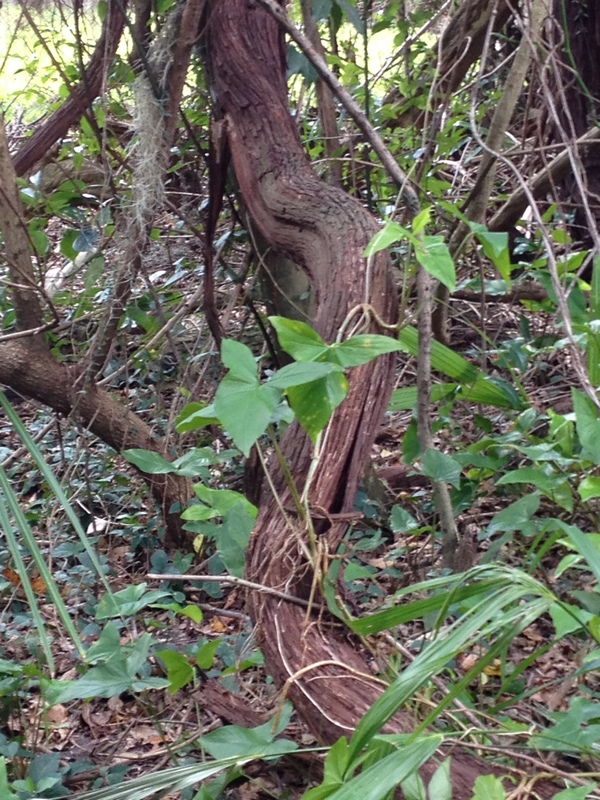 There are vines, not trees that are 10″ around. It’s crazy. They are on the ground, they have strangled huge trees and they have to go. Steve and I were walking through the yard today marking trees for removal. There are a lot of them and the tree guy said we needed to mark each tree with orange tape so the city can know with a glance when they come to approve. As I wrapped orange tape around each tree I felt guilty, like I was sending these trees to their death. I guess I am but some are already dead and most are so sickly that they need to go. There are 4 very large trees directly in front of the house that are being removed. They are covering up my porch for goodness sake. I am expecting haters to arrive when the bucket truck shows up to start removing the trees. They are camphor trees which are referred to as “scrub trees.” They die from the inside out and I would rather take them out now then when they fall on mine or someone else’s house. See the vine in the last picture on the far left? And the large tree in the center? Totally dead and strangled by the crazy vines. THEY GOTTA GO!